The image on this page is a quarter turn valve. 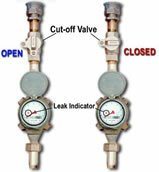 Turn the valve such that the top is in line with the meter and service line for ‘ON’. For ‘OFF’, turn the valve across the service line (with the locking ears aligned). Caution: Do not turn this valve with excessive force. This could damage the valve, resulting in replacement charges to the customer.